As a sort of finale to any interventionist or proxy war, there is the demand of the people to lay their hands on the body of the demagogue that intervention helped to free them from. The same logic seems to have subliminally sunk into the very centres of the powers of intervention. 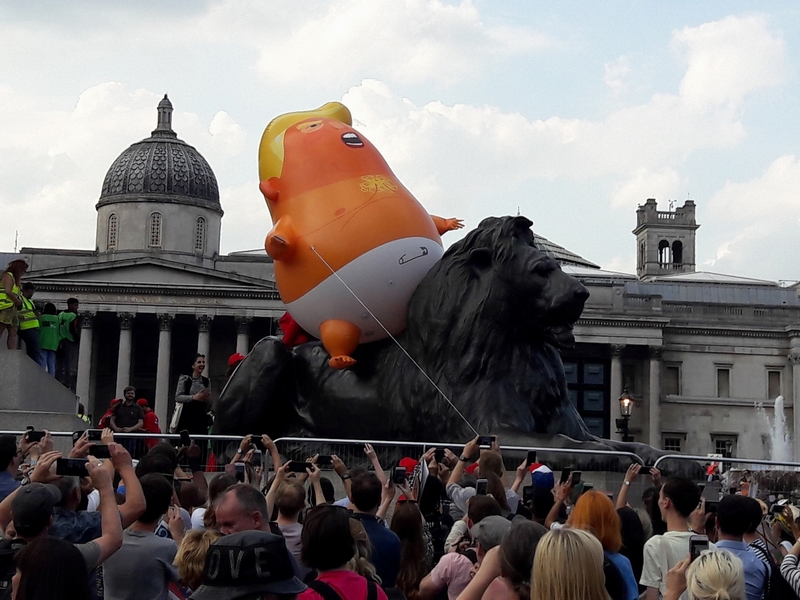 The lust for the body (of the Leader), at least symbolically, was more than apparent in the masses who greeted Donald Trump in London. 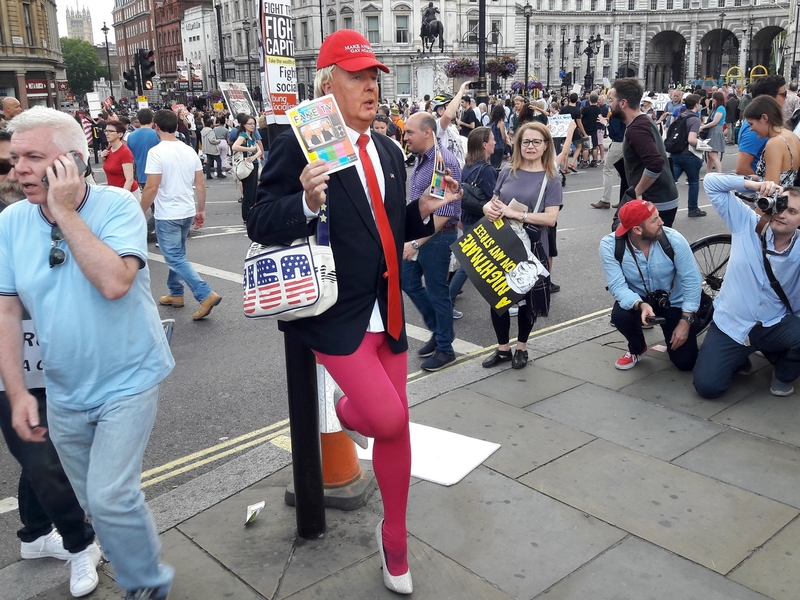 However Trump never appeared in London's public space. 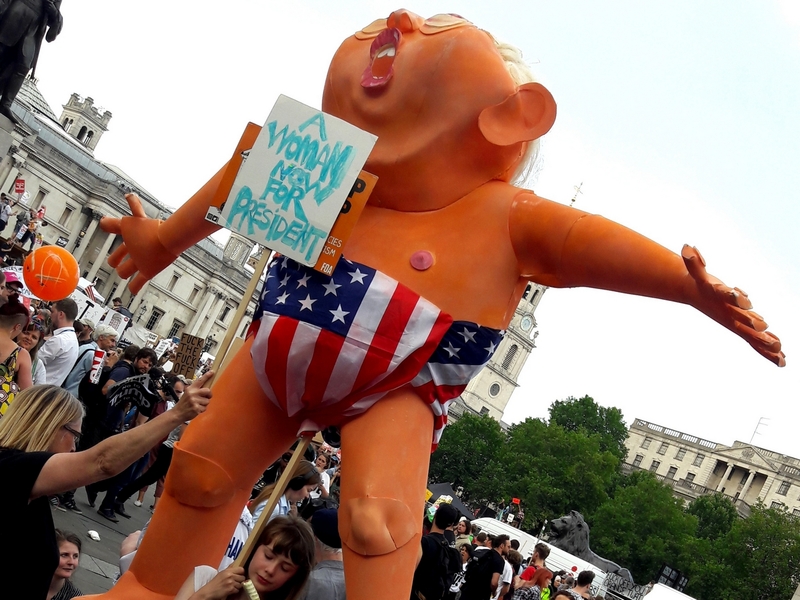 But in his absence, the people compensated themselves with self-produced avatars, effigies, and imposters; each one a do-it-yourself trope of Trump. 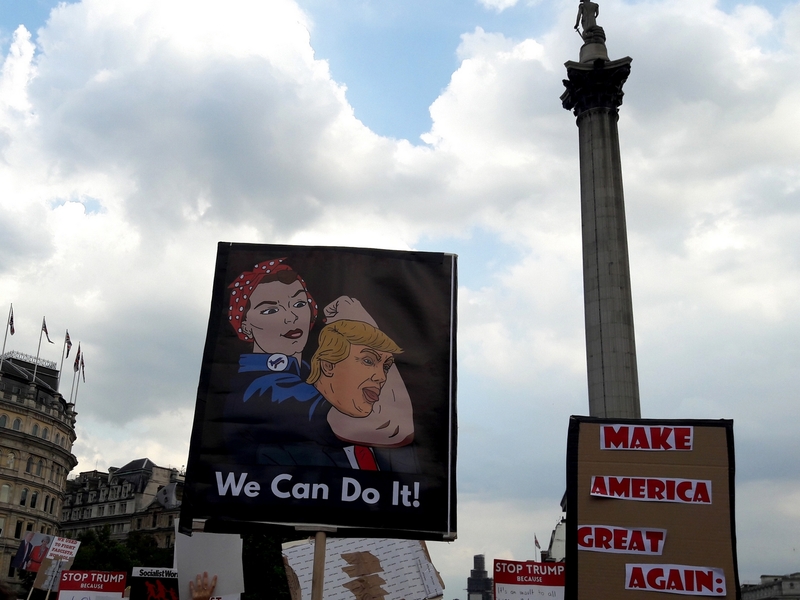 In their mockery of the person, and the person alone, the tropes amalgamated in a carnival of resistance to bare as much about us and our political horizons, as about Donald Trump. The carnival is an exposé of collective belief through unmediated popular expression. Its reverie renders visible a shared allegorical space as from the dream state Walter Benjamin suggested we inhabit in modernity and from which we may awaken. We can read the tropes of Donald Trump as naïve expressions from the dream state in the unadulterated language of the street; and as forewarnings of our modern fate that surrenders to fascism in its multiple tropes (that Benjamin diagnosed in 30s Germany). Yet this carnival by its claim to the one body in an exhibition of vulgarities recalls another aesthetic and imagination. That is the power of the carnivalesqe as from Mikhail Bakhtin's writing on the rabelaisian where terror is conquered by laughter and the grotesque body becomes the property of the people. Bakhtin's grotesque body is here of course that of our own democracy become demagogue, from which the people need protection. Writing through the imposition of 'socialist realism' as a literary form during Stalin's rule, Bakhtin found escape through Rabelais and the language of the people, the popular art that mocks and insults the deity. Mockery as the people’s power. The carnivalesqe and grotesque as their means of dissolving the system; i.e. when enclosed by it, there remained for the people a possibility of living outside it, in a parallel universe of the carnival. As Bakhtin wrote, carnival is not a spectacle seen by the people; they live in it, and everyone participates because its very idea embraces all the people. The Carnival is the people's response to the Gargantua of our age, which is that of the gargantuan alliance of money and governance. A coalition of democracy and oligarchy that enables a scale of infliction on the common akin to Rabelais' tales of Paris as when, Gargantua drowned in his urine two hundred sixty thousand four hundred and eighteen Parisians. Yet the people turn the terror of profligacy into the blind laughter of the carnival. 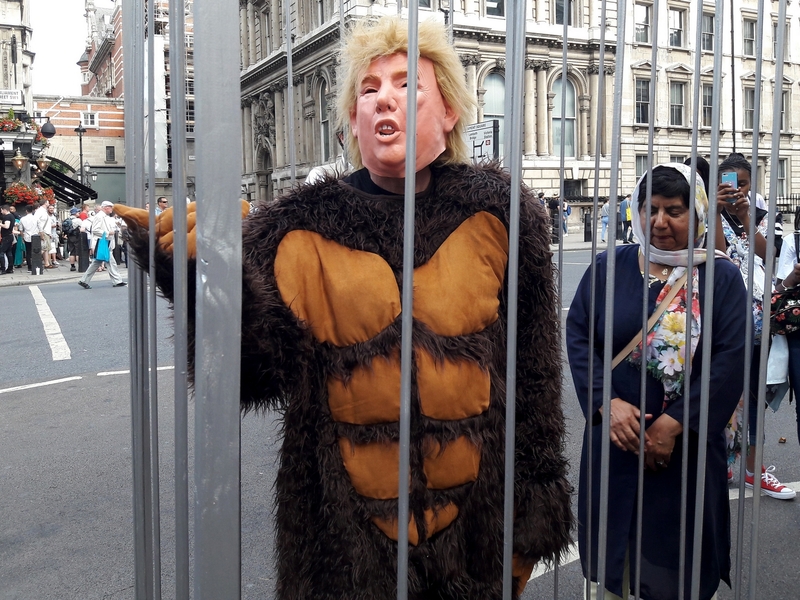 The cosmic catastrophe (of Trump in our case) represented in the material bodily lower stratum is degraded, humanised, and transformed into grotesque monsters – monsters to identify if only to mock with impunity. Freud and later Lacan described the mirror phase of life when a baby comes to recognise itself in the mirror. And so with Trump, stuck in an infantile mirror phase, condemned to recognise only himself, his own self as a trope. All of Trump's utterances are read as this, an exclusory White Eurocentric Maleness out of which comes his transparent incapacity to consider diverse social realities. Against this Bakhtin's carnivalesqe asserts itself through diversity - a plurality of consciousnesses, with equal rights and each with its own world, that combine but are not merged in the unity of the event. The carnival's contemporary practice in London revived through Afro-Caribbean community also crosses a broken bridge to a pre-colonial past of Europe's traditions. Bakhtin describes how the Renaissance and its latinisers spelt the end of the Rabelesian world and its conception of art and of people. If the two were interlinked through folk culture and 'dialects of the incomprehensible', that naive and peaceful coexistence of the dialects came to an end; they began to clarify each other, and their variety was gradually unveiled. The space by which the auratic power of the folk could exert its public (and vulgar) imagination became narrower in industrial Europe. Benjamin's adage that Art teaches us to see into things, Folk art and kitsch allow us to see outward from within things identified the reflective inversions in the Western political-aesthetic order along with the coming of the modern fascist mirror. Trump tells us again and again who the nation is for. But in that sense Trump is repeating one of our conundrums - whether it's through Hegel or Max Weber or Carl Schmitt. That the project of an universal modernity was built on the nation state and language as the bearers of an identity, and so demands the making of a people, the volk. In this making lies both the compulsive reason and the irony of modern nationalism based on the imaginary of a pre-modern racially identikit culturally harmonised people. But as Bakhtin writes of Rabelais' time, a single national language did not exist as yet; it was being slowly formed. That social life was an intense interorientation (of dialects). For Benjamin, if our broken history is connective and not progressive in the Marxist sense, the failure (of history) lies in the capacity to develop technology yet not use it to inaugurate a new political outside the old reign of property. Thus the revolutionary means of film and photograph, mass media (superceded in the digital age by the utopianism of the internet and social media) could have been deployed to create a new social order, but instead became tied to that new relation of property, the commodity. Though uncommitted to any conception of communism (whilst Bakhtin lived in its deformed Stalinist version), Benjamin's fear was that in our incapacity to forge the aesthetic and social promise of our technology, other ‘powers of enchantment’ beckon. The most cyborg of all the tropes, with hand and cellphone morphed perhaps congenitally, this bloated baby bombards us, not with depleted uranium but with rabid memes. Because the success of a meme has little to do with its veracity, in fact the opposite (the greater the falsehood, the greater the viral potential), what matters is quantity not quality. Trump's meme bombardment, analogous to what Benjamin wrote of art in the age of mechanical production, has little to do with values of the past like creativity, genius, eternal value, but deal with concepts whose uncontrolled (and at present almost uncontrollable) application would lead to a processing of data in the Fascist sense. The trope is reliant on the right bodies as receptacles, to tune them to its wavelength as a monolithic volk necessary to Make America Great again, Make Europe Great again, Make Britain Great again. As popular expression, mockery produces its wish images in the idiom of the street. But our digital age has other logics of space and production. It replicates them ad infinitum ad nauseum, with its own dynamics (of mockery and a counter mockery) just as our democratic edifice has in its own hall of mirrors (of fake news and post-truth). 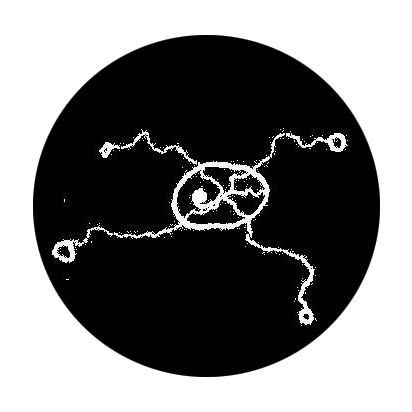 In this viral cycle, the greater the deluge, the more our need for that single corpus of power and to lay claim to a body. It's rooted in the contradiction between our means (of technology) and material conditions of our political existence as Benjamin warned. That an unrequited quest for the transparency of power also leads perversely to the one body, a spectacular enactment of the Leader. That is also why Bakhtin reminded us that grotesque realism is so opposed to severance from the material and bodily roots of the world, why carnival laughter has to build its own world in opposition to the official world , its own church versus the official church, its own state versus the official state. 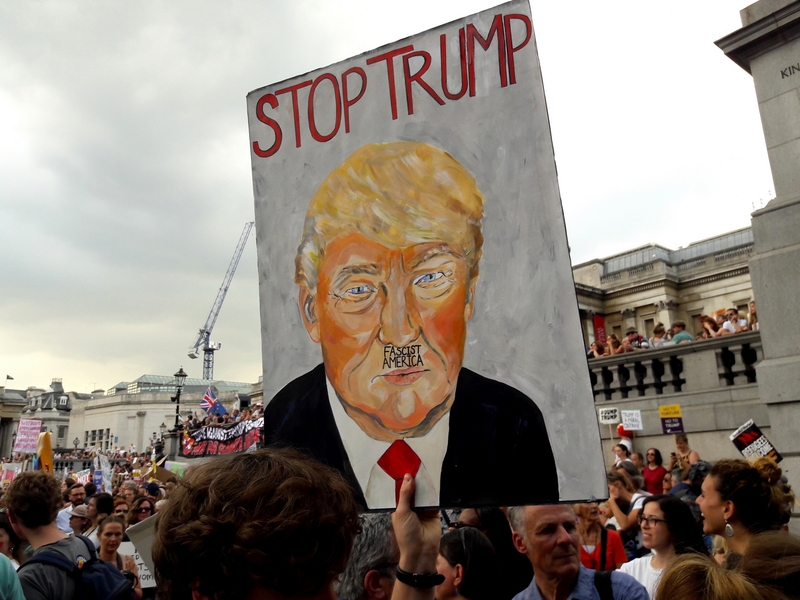 As the parameters of liberal democracy and viral technology produce more Trump tropes, the louder the carnival laughter has to become, as Bakhtin suggested in Stalin's time, to redefine the borderline between life and art for a new condition.